J. Richardson, Sr. (Lugt 2184); John Bouverie (died 1750; the Bouverie mark, Lugt 325, was probably applied at the time of the 1859 sale, below); his nephew, Mr. Christopher Hervery (d. 1786); his aunt, Elizabeth Bouverie (d. 1798); by inheritance to Sir Charles Middleton (1726-1813); by descent to his grandson, Charles Noel (1781-1866), who was created 1st Earl of Gainsborough in 1841 (sale, Christie's, London, 20 July 1859, lot 134); purchased by Allen, but remained in the possession of, or was acquired back by, the Earl; by descent within the family (sale, Christie's, London, 23 November 1971, no. 112); NGA purchase (via Yvonne Tan Bunzl, London) in 1972. Exhibition of Italian Art of the Seventeenth Century. Burlington Fine Arts Club, London, 1925, 46, no. 2. NGA Recent Acquisitions 1974, no. 30. Guido Reni: Zeichnungen, Albertina, Vienna, 1981, no. 105. 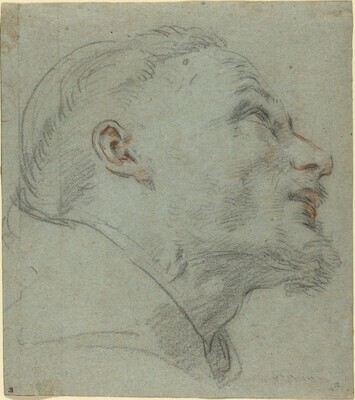 Bolognese Drawings in North American Collections, 1500-1800, National Gallery of Canada, Ottawa, no. 38 (Catherine Johnston and Mimi Cazort). Kurz, Otto. "Guido Reni." Jahrbuch der Kusnthistorischen Sammlungen in Wien 11 (1937): 218. Kurz, Otto. Bolognese Drawings of the XVII & XVIII Centuries in the Collection of Her Majesty the Queen at Windsor Castle. London, 1955 (and reprinted Bologna, 1988): 120, under no. 354.